Having a good day today? I hope so. 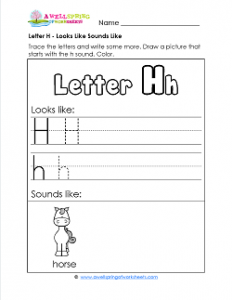 And I hope you’d like to use this letter h looks like sounds like worksheet to make your day even happier. Kids trace and write the uppercase and lowercase Hh on the lines. Then they draw a picture of something that starts with h. How about a house, or a heart, or a hat? Please have them color the horse, their picture and the “Letter Hh” at the top of the page.